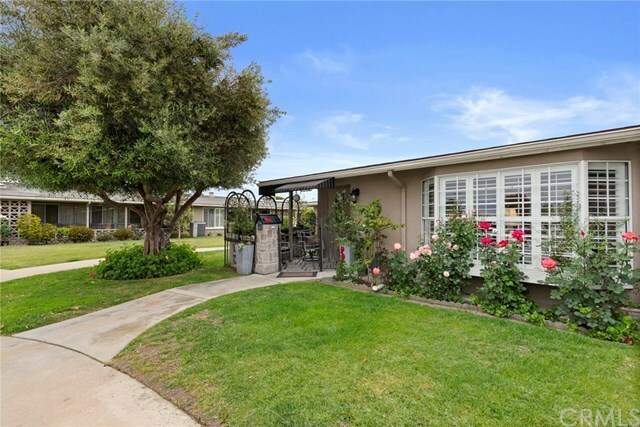 Leisure World Seal Beach - Two bedroom - One Bath - East Facing Corner- This home is almost fully expanded with a cozy patio to enjoy the morning sun. You will enter the living room through a small entry way with new front door with a stained glass window, to the living room with a Bay Window and window seat. High End Laminate Floors give this home an open feeling to the separated dining room and another bay Window. The living room opens to the adorable upgraded kitchen with an extra large Skylight, Stone counters, built-in Microwave, upgraded refrigerator with an ice-maker and a large pantry. The master bedroom is expanded with a walk-in closet and mirrored wardrobe closet. Bedroom two has a built-in Murphy bed (negotiable with sale). There are designer ceilings throughout with crown molding and shutters on every window. Warm custom colors and tasteful decor give a warm welcome feeling to walk into. PLUS! Forced Air Heating and Air Conditioning and Washer/Dryer Hook Ups. (washer and dryer negotiable with sale) Drive-up parking and close carport parking (Carport Building #81 - Space # 33) A perfect home to enjoy all that Leisure World has to offer. A gated/Guarded Senior Community for Active Senior, 55 and Better.